The Porsche Carrera GT is still counted among the most exciting sports supercars in the world, more than 15 years after it first appeared. 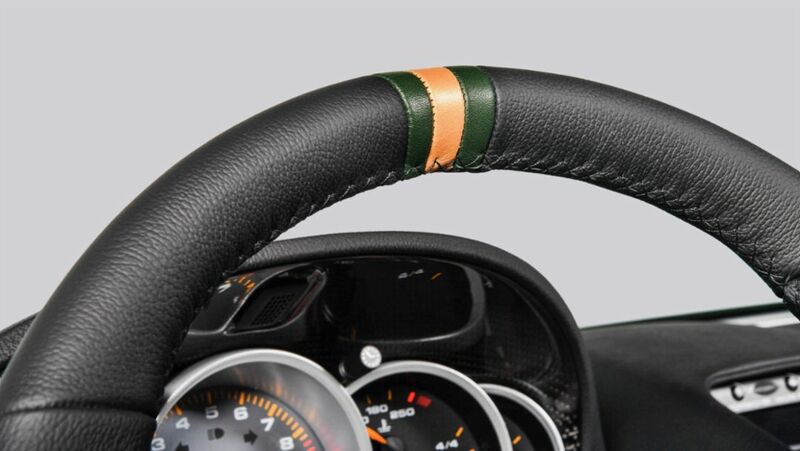 Now, Porsche Classic has implemented a spectacular reconstruction as part of a custom order. 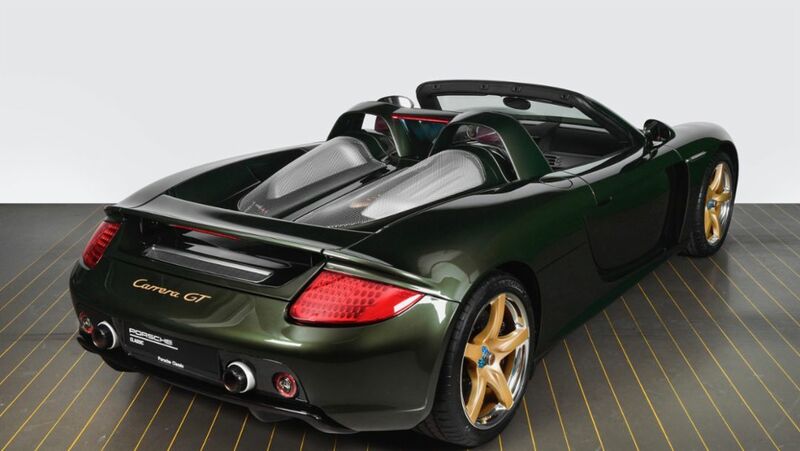 With a ten-cylinder V engine with 612 PS of horsepower derived from a Formula 1 powertrain, premium design, and – not least – the incomparable driving experience it offers, the Porsche Carrera GT remains a milestone in the world of sports supercars today, and a collector in the US has commissioned Porsche Classic to thoroughly rework one of their privately owned vehicles. It was truly a spectacular project. The collector wanted complete, custom reconstruction of the vehicle, implemented at a manufacturing quality that can only be achieved by Porsche itself. The process involved the vehicle being entirely disassembled into individual parts, with every component extensively checked, and refurbished or replaced where necessary. The complementary five-spoke magnesium tyres were specially designed, taking their initial inspiration from the legendary motorsport tyres from BBS, which had a star-spoke painted in gold and a polished rim ring. However, material experts from the Porsche R&D center Weissach advised that polishing the rim ring would structurally alter the material in such a way that it would potentially be dangerously weakened, so an alternative engineering process was required to create the desired metallic high-gloss effect rim. The solution to the challenge lay in using silver, a precious metal. In an innovative procedure that had never before been used in series vehicle construction, a silver layer was applied to create a visually chrome-like surface finish. This high-gloss silver layer requires a final protective coating though, because silver is second only to iron in terms of metals that most readily oxidise: where prolonged oxidisation on iron results in rust, silver responds to exposure to atmospheric oxygen and water by accumulating unsightly black tarnish on its surface. This is why the silver-coated rim ring required a protective layer of clear lacquer, and the star-spoke was painted in gold to match. Serving as a technical contrast to this is the blue-and-silver central wheel lock, bearing the Porsche emblem in colour. 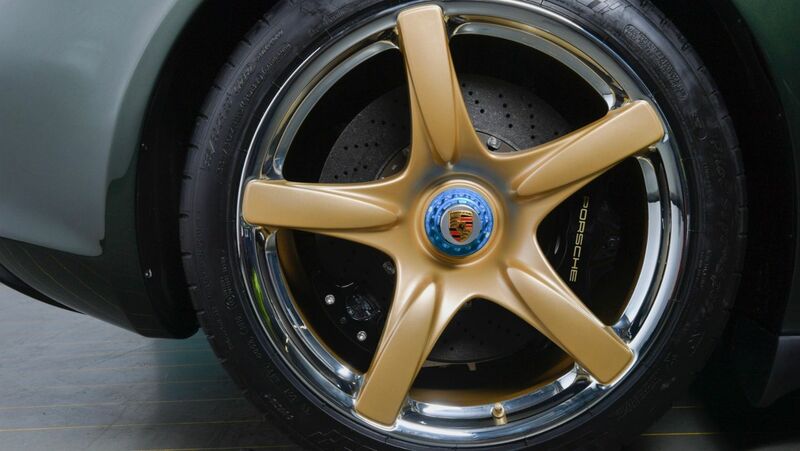 The gold of the star-spoke has also been picked up elsewhere, for example in the Porsche lettering on the brake callipers, in the engine compartment, on the intake housings, and even in the interior, where the top marking in the centre of the steering wheel is adorned by a single gold stripe flanked on both sides by a stripe of Oak Green – a discreet and individual touch. Even at this stage, the work on this special Carrera GT was far from complete. “Because the coating on older carbon fibre parts tends to yellow and fade, we spent 350 hours manually sanding and recoating all the carbon fibre components, including the monocoque,” explains Uwe Makrutzki, Manager of Porsche Classic Factory Restorations in Stuttgart. The vehicle is now ready for delivery, and at the invitation of Porsche Cars North America, Porsche Classic has presented it for the first time at the Porsche Experience Center in Atlanta, to a select group of 100 invited guests including the car’s owner. Porsche Classic also hosted a symposium to coincide with the event, moderated by motor journalist Pete Stout, and featuring Alexander Fabig, Head of Customer Center, Uwe Makrutzki, Manager of Porsche Classic Workshop Restoration, record-winning race driver David Donohue, and Porsche Designer Tony Hatter, who were all available to talk about the project and answer questions. Porsche Classic takes care of all vehicles whose production end date is generally more than ten years in the past. These include legendary sports cars, such as the 356, 914, 959 and 911 up to and including type 996, as well as all four and eight-cylinder vehicles, such as the 924, 928, 944 and 968, and the Porsche Boxster, type 986. Since 2016, Porsche Classic has also been responsible for the genuine parts supply of the Carrera GT super sportscar. Further information is available at www.porsche.de/classic.